An auto body and repair shop are a rewarding business that allows you to interact with customers daily. Working with customers and the customer's property regularly can put your business at risk when problems arise. By setting up the appropriate types of Auto Body Shop Insurance also known as Garage Insurance, you can take steps to minimize potential risks and problems along the way. Keep in mind also that you may need separate coverage for your commercial auto's, workers compensation and group employee benefits like health and life insurance. Let one of our auto body shop insurance specialists find the right coverage for you today. 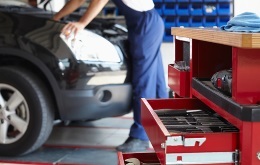 Contact us to find out more about auto service insurance in Monroeville Pennsylvania including the Murrysville, Oakmont, Penn Hills, Plum, and Verona areas.